This is a simple modeling dough that can be made in less than 15 minutes. If you don't have all the ingredients on hand, that's no problem! You can make it with just flour, salt and water. The vegetable oil is added to make the dough easier to work, and the alum acts as a preservative. Both of these ingredients are optional. This recipe makes about 1 cup of a very pliable dough. 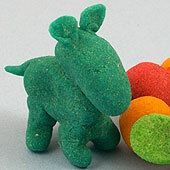 It is easy to work into shapes that can be air-dried and painted. 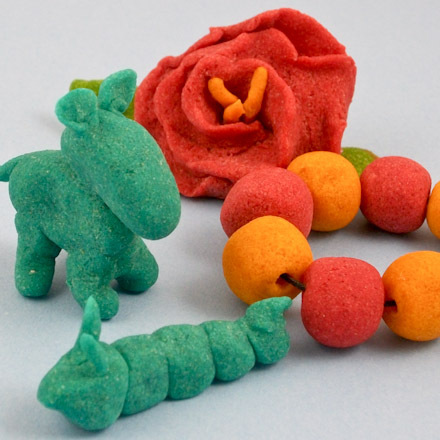 Or, you can use the modeling dough time and time again as a play dough, if you are careful to store it in a sealed plastic bag or container between uses. 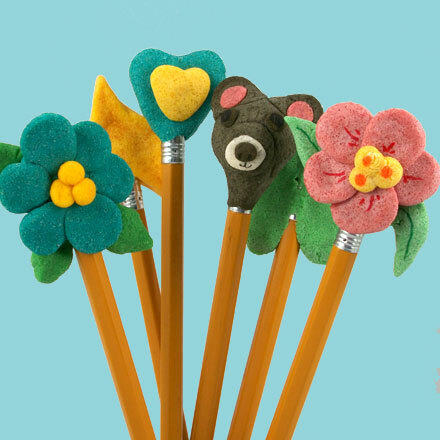 Related crafts: Use the modeling dough to make some fun and fanciful Pencil Toppers or imaginative Refrigerator Magnets or Christmas Ornaments, Magnets and Figurines. You can even use it to make turkey playing pieces for the game of Turkey Trot. Caution: Recipe uses boiling water. Adult supervision is required! This recipe is rated EASY to make. Requires adult supervision!!! To use it: Pinch off as much dough as you need to make your shape, and leave the rest in the sealed container. Work the dough into any desired shape with your hands or just about any kitchen utensil. When you have finished molding your shape, put it on a piece of waxed paper to dry. It should dry in about 24 hours to a hard finish. Pieces may be left plain, or can be painted to add durability. Small pieces can be painted with nail polish, while you will want to use varnish or an acrylic sealant like Mod Podge for larger pieces. 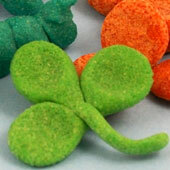 The shamrock, pictured to the left, is made with three small balls of green dough that are flattened with a pinch of your thumb and index finger. 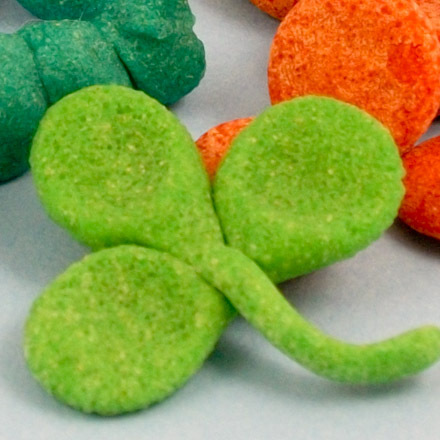 One side of each flattened ball is squeezed to a point to make a petal shape. The three petals are pressed together along with a stem. A dab of water can be used to glue the pieces together. That's it! 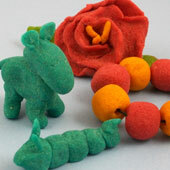 What will you sculpt with the modeling clay? 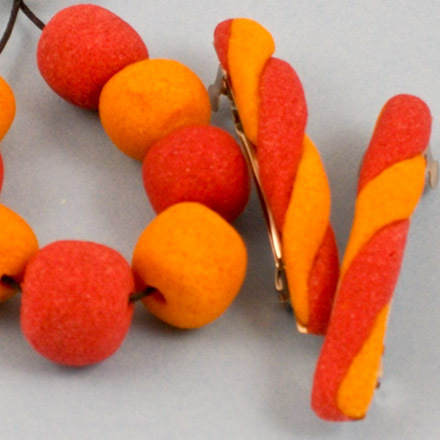 Tip: It's easy to make jewelry with modeling dough. Poke balls of dough with a toothpick to make beads. To make barrettes, twist two dough snakes together and shape over hair clips. 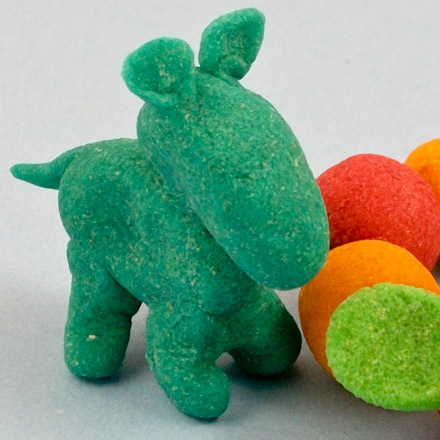 Tip: Make animals, like this baby hippo, with the modeling dough. 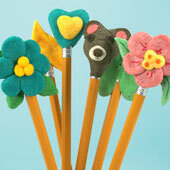 Related craft: Make some fun and fanciful Pencil Toppers using Homemade Modeling Dough.